Dell has a long history of making great monitors, but the S2716DG is its first attempt at a gaming model. The 27in TN panel packs in 2560 x 1440 pixels, a G-Sync processor, and it can run at up to 144Hz. So has Dell nailed it first time? Or is it the old rule of never buy a first-gen product? 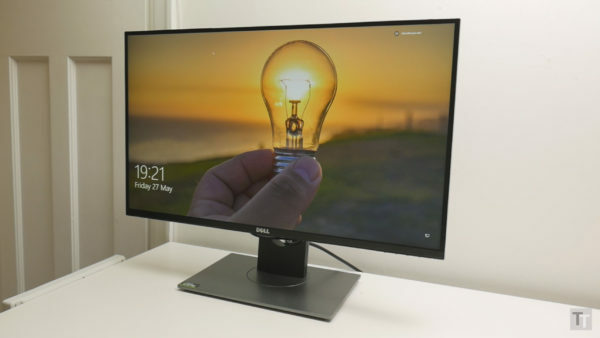 Well Dell has definitely got things right when it comes to design as this is a fantastic looking monitor. It has all the simple business like elegance we’ve come to expectfrom Dell, and has several particularly nice touches that really finish the look off. There are super-slim bezels that almost completely disappear when the display is off, plus the OSD buttons are cleverly hidden on the underside of the frame, where they’re easy to reach but don’t clutter up the bezel. In fact the only thing I’m less keen on is the glossy black back which will show dust, fingerprints and scratches far more than a more conventional rough matt finish. The stand, though, is excellent. Easily assembled and surprisingly lightweight it still provides a really sturdy platform and offers a full range of ergonomic adjustments. There’s also a 100mm VESA mount on the back. Less impressive is this display’s connectivity options. Its G-Sync processor limits it to having just one DisplayPort and one HDMI. That’s enough for most people but none-G-Sync alternatives tend to offer more. You get plenty of USB 3.0 ports, though, with two on the back and two on the left side. Here there’s also a headphone jack, though oddly Dell has chosen not to add speakers to the S2716DG. I can see the logic, as most people simply never use them, but on an expensive gaming monitor like this it’s just one of those extras you expect, no matter how rubbish they actually sound. As for the OSD, it’s largely very good thanks to a nice clear layout. The hidden buttons can be slightly awkward but the onscreen button indicators largely keep you on track. However, you get little in the way of gaming modes or options for tweaking the colour. Which is a shame as the default image quality of this display isn’t all that great. On paper it doesn’t look too bad, with a reasonably accurate colour temperature, good sRGB colour coverage and even the Delta E isn’t bad for a TN LCD. However the contrast figure of 796:1 is below par and in fact in person the display looks even worse than that figure would suggest. It’s just so washed out, with blacks very grey and lacking in depth. Once calibrated the recorded contrast ratio drops even further to just 673:1, though in most other areas it does improve. Nonetheless, once you factor in the poor viewing angles that you inevitably get from using a TN panel, this display seriously comes up short on overall image quality. Left to right viewing angles are okay but top to bottom there’s noticeable shift in colours and contrast, to the point where there’s a perceived difference in colours between the centre of the screen and the edges. Not that the screen actually has an uneven backlight, in fact in benchmarks it proves impressive, with no greater than 6.6% drop in brightness, but in real life it doesn’t look it. So, yeah, overall image quality is not this display’s strong suit. Meaning it really is all about its gaming performance, which is fine. Its 144Hz panel has just a 1ms response time that puts it ahead of even the latest high refresh rate IPS panels that are generally around 4ms. You’ll be hard pushed to notice the difference but technically it’s there. When combined with G-Sync you end up with a smooth, ultra-responsive experience. So as a pure gaming tool, this display is up to the task. As a result when it comes to an overall assessment of this monitor, it’s a tricky one to call. Currently available for £389.99 this is among the cheapest G-Sync monitors you can get of this size and resolution, and given it’s a nice looking machine with plenty of features, that actually makes it worth considering. However, if you value overall image quality at all, whether it’s for accurately editing your photos, watching video or just generally for desktop use, then the S2716DG really doesn’t cut it. Even within the realms of TN gaming panels there are markedly better options.